The Special Exhibits Gallery of the Kuroda Memorial Hall. From the right, the pieces are KURODA Seiki’s Woman Reading, Maiko Girl, and Wisdom, Impression, Sentiment. The gallery is open to the public for 2 weeks during the New Year holidays and 2 weeks in the spring and fall. The Kuroda Memorial Hall that stands in one corner of Ueno Park is the Institute’s birthplace. The building where the Hall is now located was built in conjunction with a bequest by the Western-style painter KURODA Seiki, who is revered as ”the father of Japanese modern Western-style painting.” This is the same building in which the Art Research Institute, the predecessor to today’s National Research Institute for Cultural Properties, Tokyo, was established in 1930. The building houses the Kuroda Memorial Hall, a repository and gallery that showcases KURODA’s career as a painter. In addition to his bequest, KURODA Seiki also donated pieces of his work. These works, which include Lakeside and Wisdom, Impression, Sentiment, have been put on public display. In 2000, the Institute took over the building’s role as an exhibition site, and the Institute continued to manage the building until 2007, when the Tokyo National Museum assumed control over its management. Over a period of about 3 years, the building has been earthquake-proofed, and on January 2 the building reopened. Renovations involved the creation of a new gallery, designated the Special Exhibits Gallery, that seeks to give visitors greater insight into KURODA’s career as a painter. In addition to the works Lakeside and Wisdom, Impression, Sentiment, the gallery now also houses Woman Reading and Maiko Girl, which are works that were previously curated by the Tokyo National Museum. The gallery provides a place in which one can enjoy signature works by KURODA Seiki (the gallery will be open to the public for 2 weeks during the New Year holidays and 2 weeks in the spring and fall). The Kuroda Memorial Hall has exhibited KURODA’s works since its establishment. The Hall will be open to the public on days when the Tokyo National Museum is open, providing even more opportunities to enjoy KURODA’s works. 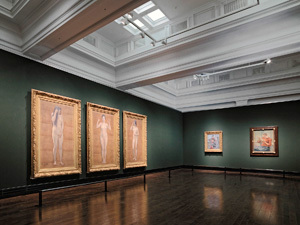 Exhibitions at the Hall are arranged to allow an overview of KURODA’s career as a painter. Since the Institute relinquished its control over management of the Kuroda Memorial Hall, it has continued to focus on research into KURODA Seiki, who was closely involved in the Institute’s founding. Volumes on Kuroda that the Institute has published can be perused in the Library on the second floor of the Memorial Hall. In addition, the Institute’s website http://www.tobunken.go.jp/kuroda/index.html offers access to basic information for research into KURODA, such as high-resolution images of his works and the text of the diary he wrote. Please feel free to have a look. Together with the Tokyo National Museum, the Department of Art Research, Archives, and Information Systems has continued to conduct joint studies of Buddhist paintings from the Heian Period in the National Museum’s collection. Each year, the National Research Institute for Cultural Properties, Tokyo uses its high-resolution digital imaging technology to image a single work in order to assemble data so that researchers can learn about the finer aspects of the techniques used to produce the work. These data have allowed identification of extraordinary techniques that would not have been apparent with the naked eye. Researchers from the Tokyo National Museum and the Institute have explored how these techniques relate to the sophisticated pictorial depictions in Buddhist paintings from the Heian Period. As part of this year’s study, A Painting of Mahamayuri (jpn.Kujaku-myō-ō) (National Treasure) was imaged on January 15, 2015. The image data obtained will be shared with researchers from the Tokyo National Museum, and in the future researchers from the two facilities will explore the painting’s place in art history. The Art Discovery Group Catalogue as was mentioned in the title of Ms. KAWAGUCHI’s presentation is a bibliographic search system that came on line in 2013. According to Ms. KAWAGUCHI, the system “allows a search of the catalogues of over 60 art libraries in countries around the world along with 1.4 billion journal articles.” Moreover, the system has an interface in Japanese as well. This allows information to be provided by the National Diet Library in Japan in addition to information from major art libraries in the US and Europe. Pursuant to a 3-year plan, the Institute is currently creating a cultural properties archive, so presentations on recent trends overseas like that by Ms. KAWAGUCHI are a valuable source of information and a prominent indicator of efforts abroad. The Getty Research Institute in the US played a major role in the creation of the Art Discovery Group Catalogue, and Ms. KAWAGUCHI described some of the Research Institute’s efforts related to collecting and disseminating information in the Catalogue. In October of last year, the Director of the Getty Research Institute and colleagues visited the Institute, so the presentation provided information that would prove useful in discussions of future joint studies by the Research Institute and the Institute. The presentation mentioned the website of the National Museum of Western Art, and the Museum is actively working to make research information available on its website. This description was a valuable reference for determining the future direction of information dissemination by the Institute. The Institute plans to continue talks with an eye toward coordinating with the National Museum in the future. On January 24, efforts to preserve and pass on a technique to make winnowing fans from Japanese wisteria (nationally designated as an Intangible Folk Cultural Property) were surveyed. This technique has been passed down in the Kizumi area of the City of Sosa, Chiba Prefecture. Winnowing fans are an essential tool for everyday life since these fans are used to carry items and separate grain from chaff. These fans are also ceremonial implements that are used in festivals and annual events. These fans are thus an essential part of life. Three techniques to make these winnowing fans have currently received national designation as an Intangible Folk Cultural Property (folk technique). One of these techniques is practiced in the Kizumi area of the City of Sosa, where winnowing fans continue to be made using Japanese wisteria and dwarf bamboo. Winnowing fans from the Kizumi area are light, sturdy, and extremely flexible, and these fans were widely used throughout the Kanto region. The heyday for the making of winnowing fans was from the Taisho Period to the mid-1950s, when the Kizumi area and surrounding areas produced 80,000 winnowing fans annually. However, changes in the social climate and the spread of plastic baskets and baskets from China have resulted in a sharp decline in current demand for the winnowing fans. The Kizumi Society to Preserve the Making of Winnowing Fans was formed to pass on the technique to make winnowing fans in the Kizumi area. Starting in 2010, the Society has conducted a class to pass down the technique and the Society has worked to foster individuals who will continue to pass on the technique. The class is held monthly. Local individuals who wish to pass down the technique act as teachers, and they work tireless to collect materials for the winnowing fans, work those materials, make the fans, and put on demonstration sales at local festivals. Students attending the class vary in age; some wish to start making the winnowing fans after mandatory retirement, some are learning how to make winnowing fans while working bamboo professionally or semi-professionally, and some are local organic farmers. Regardless of who they are, the students are passionate about learning. Some of the students are residents of the Kizumi area while others attend monthly from places such as the Town of Yokoshibahikari and the City of Kamogawa. 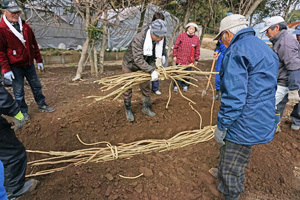 The class on January 24 had several dozen students who learned about harvesting Japanese wisteria and dwarf bamboo and then treating and working those materials. The demand for many folk goods has declined sharply due to changes in the social climate and the spread of materials and tools that can be used to mass produce items at a low cost. Circumstances continue to hamper the passing down of folk techniques. If those techniques are no longer needed by society, how will values change? Is there a point to passing down those techniques and if so how? Numerous communities are facing these issues. 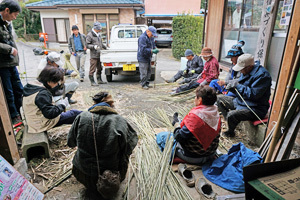 The survey found that residents of the Kizumi area have created a place and an atmosphere where people can learn how to make winnowing fans and they have taken in outsiders who are interesting in learning how to make those items. The residents do this as part of their own life’s work, as a hobby, or as practitioners of an art. The survey revealed evidence of a new relationship emerging in which people are no longer forced make winnowing fans as an occupation, as they were in the past. Instead, people have decided themselves that they want to make winnowing fans. As the evidence indicated, this approach may constitute a new model with which to pass down techniques. This approach is possible because values are more diverse today, so people have the option of reexamining traditional culture and seeking to return to a life more in tune with nature. From January 7 to 23, the Japan Center for International Cooperation in Conservation (JCICC) conducted a field survey on the safeguarding of cultural heritage in Iran. The survey included 9 World Heritage sites in Iran. The survey was conducted in order to determine the current state in which Iranian cultural heritage is safeguarded and to explore the possibility of future international cooperation in this regard. As of 2015, Iran is a cultural colossus with 17 World Heritage sites. A tour of cultural heritage sites such as Persepolis and Naqsh-e Jahan Square in Isfahan was conducted in cooperation with Iran’s Cultural Heritage Handicrafts and Tourism Organization (ICHHTO). JCICC personnel were able to hear directly from site managers about site preservation and restoration efforts and current issues regarding the safeguarding of cultural heritage. In Tehran, JCICC personnel talked with Dr. M. TALEBIAN, the vice president of ICHHTO. 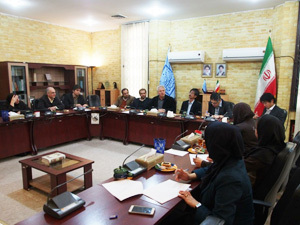 JCICC personnel described projects by the Institute and they discussed the nature of future efforts to safeguard cultural heritage with Dr. TALEBIAN based on their inspection of cultural properties at different sites in Iran. In addition, JCICC personnel visited Iran’s Research Institute for Cultural Heritage and Tourism (RICHT), a leading research institute in Iran. JCICC personnel toured the RICHT and discussed cultural heritage with RICHT personnel. 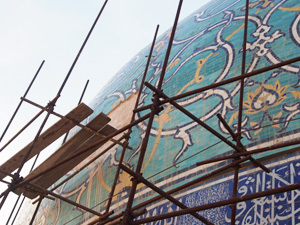 Through the UNESCO Japanese Funds-in-Trust, Japan has previously provided support for restoration of the Chogha Zanbil ziggurat and the Arg-e Bam site that were ravaged by an earthquake in 2003. Thus, Iran has already engaged in cultural exchanges with Japan. The hope is that such efforts will foster greater cooperation between Japan and Iran and allow joint studies and conservation efforts with Iran in the future. From January 13 to 23, a training session was conducted at the Bagaya Monastery in Innwa and at the Mandalay branch of Myanmar’s Department of Archaeology and National Museum (DoA). Major topics of the training were survey methods to trace the history of modifications in building structures from the period of initial construction and applied building techniques. Trainees were 10 personnel from the DoA, an associate professor from the Technological University (Mandalay), and a graduate of the university as an observer. Some trainees used CAD images when they presented the results of surveys conducted in groups. Trainees appeared to be quite adept at sketching plans in comparison to when they started the training. Such evidence of trainees taking the initiative and the effectiveness of continued training is truly a joy to behold.